Coastal zone is one of the marine environments where the most intense and harsh conditions in the world occurs. This aquatic biome often deals with the changing of tide daily allowing extreme exposure to sunlight so that high temperature, increase salinity (due to intense evaporation) and low water supply is often experienced in this area. Moreover, this part of the aquatic world is open to strong action brought about by the wave thereby making this region the most severe environment to live in. In spite of this, vast array of animals exist because they are well adapted to these extreme conditions. Among these diverse organisms are the molluscs which are the most familiar form of invertebrates on earth. This group of animal is very important ecologically and economically since they create a vital link in the marine food web (Burkepile 2007; Castell & Sweatman 1997) and the edible forms are source of protein for human consumption, while the shells are known for its use as raw materials for poultry feeds, cement producer, fertilizers, ornamentals (Paul et al 2014; Tabugo et al 2013; Del Norte-Campos et al 2003; Floren 2003; Schoppe et al 1998) and even has the potential as antiviral drugs (Chatterji et al 2002). Due to these, the coastal zone can therefore be considered as the most productive and since it is easily accessible, this region is vulnerable to impacts of anthropogenic activities (Vaghela et al 2010). Without a doubt, exploitation of natural resources (i.e unregulated harvesting) are now causing catastrophic effects on the molluscan fauna of the intertidal zone (Doloroza & Dangan-Galon 2014; Jontila et al 2014; Gomez & Mingoa-Licuanan 2006) as a result of rapid increase in human population, tourist development and commercial demands. Interplay among environmental (sediment size, wave action, salinity of the interstitial water, organic matter and calcium carbonate contents of the sediment) and biological factors (predation, competition and recruitment) affects the temporal and spatial changes in species abundance in biological communities (Flores-Rodríguez et al 2014; Esqueda-Gonzalez et al 2014; Rahman & Barkati 2012; Batomalaque et al 2010; Rios-Jara et al 2009; de Arruda & Amaral 2003; Azouzi et al. 2002). In the Philippines, intense human activities (for instance, harvesting, tourism and fishing) has resulted to un-controlled over exploitation of natural resources especially commercially important species despite international and local laws that banned the harvesting of these valuable commodities. In order for sustainable use of marine and coastal living resources to become successful, sufficient information on biological diversity must be done. Studies on diversity and abundance on molluscs in the country are inadequate which include the works of Dolorosa & Dangan-Galon (2014), Picardal & Dolorosa (2014), Dolorosa & Jontila (2012), Batomalaque et al (2010), Dolorosa & Schoppe (2005) with relatively few works done in Mindanao, Philippines (Manzo et al 2014; Tabugo et al 2013). Therefore, the aim of this study is to do assessment on the abundance of molluscan assemblage (gastropods and bivalves) in the intertidal zone of Butuan Bay with the following objectives: (1) to measure the physical and chemical parameters of the water (DO, temperature, salinity and pH), and the sediment contents (total organic matter, calcium carbonate and grain size); (2) to come up with a list of gastropods and bivalves by identifying collected molluscs; (3) to compare the abundance and diversity of these molluscan assemblage between established sites; and (4) to identify which among the physical, chemical and sediment contents that may control or influence the distribution and abundance of gastropod and bivalve assemblage. It is hoped, that monitoring molluscan biodiversity of any marine ecosystem specifically the easily accessible intertidal zone will allow appropriate assessment of the effects of anthropogenic (e.g., pollution, unregulated harvesting, habitat degradation and fishing practices) as well as natural (e.g., hurricanes and currents) factors on species diversity and abundance. Butuan Bay is located in the northeast section of Mindanao and is part of Bohol Sea. It has a latitude of 9°04′N and longitude of 125°22′E (http://en.wikipilipinas.org/index.php/Butuan_Bay). The well-known Agusan River, which is the longest river in Mindanao, brings freshwater into Butuan bay. The bay is an important fishing ground where most of the fishermen catch tuna and sardines (Wernsted & Spencer 1967). 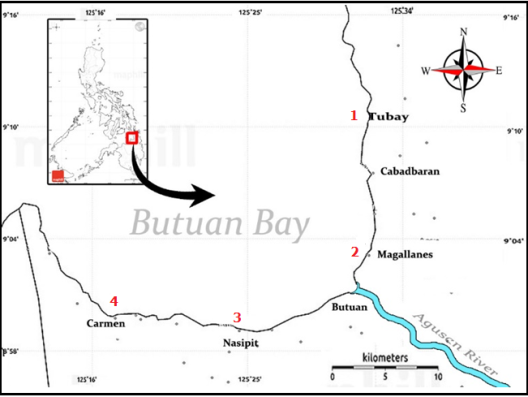 Four sampling sites will be positioned on the intertidal zones of Butuan Bay, Agusan del Norte for the assessment of molluscs (Figure 1). These sites will be chosen on the basis of the type of substrate and presence of industries, beach resorts and bamboo houses or shanties constructed along the coastline. distributor of match in the country. About 250 meters away from this station is the outlet of Agusan River which was reported to have carried with it run-off waters contaminated with residues of mercury and cyanide believed to have come from Mt. Diwalwal, the biggest mining site located in Compostela Valley (http://www.bar.gov.ph/digest-home/digest-archives/94-2003-4th-quarter/3282-oct-dec03-mercury-contamination-in-agusan-river). The intertidal flat is distinguished by a muddy flat substrate. Station 3 will be established at Barangay Sta. Ana, Nasipit where the Aboitiz floating power barge was situated. The barge makes use of petroleum to provide electricity to the entire province of Agusan del Norte during long episode of power shortage. Fish pens are also visible along the area. This area is made up of muddy flat with mangroves situated along the shoreline. Station 4 will be placed at Barangay Vinapor, Carmen where the intertidal zone hosts diverse species of corals and seagrass bed. This site is devoid of any industries although several beach resorts are present. Three transects, with lengths of 50 meters and positioned perpendicular to the shore, will be placed on the intertidal flat of each sampling site. The interval between transect lines will be 50 meters. Along each transect, four 1×1 meter quadrats set 10 meters apart from each other, will be laid. Within each quadrat, all environmental parameters, sediment samples for analysis of sediment contents, and all molluscs seen will be quantified “in situ” and will be gathered, respectively. Forty-eight quadrats (48 m2) will be laid down on the intertidal zones for the entire sampling sites during low tide. Employing a GPS (Garmin GPSMAP 76S), coordinates for each sampling sites will be taken. Determination of the physical and chemical factors namely, dissolved oxygen, temperature, pH and salinity will be done directly on the field using the portable DO meter (AMSTAT, AMT07), pen type pH meter (PH-009) and refractometer (ATAGO), respectively. Fifty grams (50g) sediment samples will be collected for the analysis of total organic matter and calcium carbonate using a plastic corer. Soil samples for the grain size determination will be obtained by gathering 200g sediments using a grab sampler. Sediment collected will be placed separately in a Ziploc bag and labelled properly. Three sediment samples for the sediment content analysis will be obtained in every quadrat and will be placed inside the freezer until laboratory analysis. Samples for the collection of epifauna molluscs will be done by means of picking up live organisms seen on the sediment inside each of the quadrat. Specimens gathered will be stored inside a labelled plastic container and will be preserved with 10% formalin-seawater solution. Conversely, infauna species will be collected using a grab sampler which will be pushed to a depth of 15cm in the center of the quadrat. Sediment sample for the infauna species will be placed in a Ziploc bag. Infauna species will be removed from the soil by sieving through a sieve with a 500µm mesh opening. Molluscs retained on the sieve will be transferred to a tray and each species encountered will be hand-sorted and preserved in 10% formalin-seawater solution. Immediately, all molluscs will be cleaned, identified to species level and counted. A voucher specimen of each representative species will be set aside and its soft tissues will be removed, its shells will be cleaned and measured to the nearest 0.1 mm using a Vernier caliper and then pictures will be taken using a digital camera (Sony Cyber-Shot, 16 MP). Counts will be expressed as numerical and relative abundance. Numerical abundance will be expressed as number of individuals per m2, while relative abundance for each species will be calculated as a percent of total molluscan species present. Molluscs will be identified using the standard works of Springsteen & Leobrera (1986) and the illustrated guides to marine gastropods (http:// www.gastropods. com.) and seashells (www.seashellhub.com, www.jaxshells.com.). Particle size will be determined based on the USDA Soil Textural Triangle. Index for diversity profiles will be calculated using Shannon-Weaver Index, Margalef Index and Menhinick Index in order to determine changes in the composition of molluscs species. Variation on the abundance of molluscan species between sampling stations will be analyzed using One-way ANOVA. To know which among the environmental parameters and sediment contents that may influence the numerical abundance of molluscan assemblage, the Canonical Correspondence Analysis (CCA) will be used. Similarities among molluscan assemblage will be determined using the Cluster Analysis (Wards Method). PAST (PAleontological STatistical) software version 2.17 will be employed for all the statistical analyses (http://folk.uio.no/ohammer/past/) (Hammer et al., 2001). Macoma balthica: biotic variables in relation to density and abiotic factors. Mar Ecol Prog Ser 234:159–170. Batomalaque G. A., Arce B. G. P., Hernandez M. B. M., Fontanilla I. K. C., 2010. Survey and spatial distribution of shoreline malacofauna in Grande Island, Subic Bay. Philippine Journal of Science 139 (2):149-159. Burkepile D., E., Hay M. E., 2007 Predator release of the gastropod Cyphoma gibbosum increases predation on gorgonian corals. Oecologia 154(1):167–173. Castell L. L., Sweatman H. P. A., 1997 Predator-prey interactions among some intertidal gastropods on the Great Barrier Reef. J. Zool. 241(1):145–159. Chatterji A., Ansari Z. A., Ingole B. S., Bichurina M. A., Marina S., Baikov Y. A., 2002 Indian Marine Bivalves: Potential Source of Antiviral Drugs. Current science 8(10):1279-1281. Das B. M. 2009 Soil Mechanics Laboratory Manual. 7th Edition, Oxford University Press Inc, New York. de Arruda E. P., Amaral A. C. Z., 2003 Spatial distribution of mollusks in the intertidal zone of sheltered beaches in Southeastern of Brazil. Revista Brasileira de Zoologia 20(2):291-300. Del Norte-Campos A. G., Declarador M. B., Beldia R. A., 2003 Catch composition, harvest and effort estimates of gleaned macroinvertebrates in Malalison Island, Northwestern Panay. University of the Philippines Visayas J Nat Sci 8:129–141. Dolorosa R. G., Dangan-Galon F., 2014 Species richness of bivalves and gastropods in Iwahig River-Estuary, Palawan, the Philippines. International Journal of Fisheries and Aquatic Studies 2(1):207-215. Dolorosa R. G., Jontila J. B. S., 2012 Notes on common macrobenthic reef invertebrates of Tubbataha Reefs Natural Park, Philippines. Science Diliman 24:2:1-11. Dolorosa R. G., Schoppe S., 2005 Focal benthic mollusks (Mollusca: Bivalvia and Gastropoda) of selected sites in Tubbataha Reef National Marine Park, Palawan, Philippines. Science Diliman 17:2:1-10. Esqueda-Gonzalez M. D., Rios-Jara E., Galvan-Villa C. M., Rodriguez-Zaragoza F. A., 2014 Species composition, richness, and distribution of marine bivalve molluscs in Bahia de Mazatlan, Mexico. ZooKeys 399:43–69. doi: 10.3897/zookeys.399.6256. Floren A., 2003 The Philippine shell industry with special focus on Mactan, Cebu. Coastal Resource Management Project of the Department of Environment and Natural Resources. United States Agency for International Development, 50 pp. Flores-Rodríguez P., Flores-Garza R., García-Ibáñez S., Valdés-González A., Violante-González J., Santiago Cortés E., Galeana-Rebolledo L., Torreblanca-Ramírez C., 2012 Mollusk species richness on the rocky shores of the State of Guerrero, Mexico, as affected by rains and their geographical distribution. Natural Resources 3:248-260. Gomez E. D., Mingoa-Licuanan S. S., 2006 Achievements and lessons learned in restocking giant clams in the Philippines. Fisheries Research 80(1):46-52. Hammer O., Harper D. A. T., Ryan P. D., 2001 PAST: paleontological statistics software package for education and data analysis. Palaeontologia Electronica 4:1-9. Jontila J. B. S., Gonzales B. J., Dolorosa R. G., 2014 Effects of poaching on Topshell Tectus niloticus population of Tubbataha Reefs Natural Park, Palawan, Philippines. The Palawan Scientist 6:14-27. Manzo K., Estandarte M. H., Dalipe R. E., Ulangutan J., Lecera J. M., Acob A., Diamalod J., Salmo W., Jumawan J., 2014 Survey and diversity of intertidal mollusks in Alabel and Maasim, Sarangani Province, Philippines. AACL Bioflux 7(6):449-457. Moghaddasi B., Nabavi S. M. B., Vosoughi G., Fatemi S. M. R., Jamili S., 2009 Abundance and distribution of benthic foraminifera in the Northern Oman Sea (Iranian side) continental shelf sediments. Research Journal of Environmental Sciences 3(2):210-217. Paul P., Panigrahi A. K., Tripathy B., 2014 A study of marine molluscs with respect to their diversity, relative abundance and species richness in North-East coast of India. Indian Journal of Applied Research 4(12):538-541. Picardal R. M., Dolorosa R. G., 2014 The molluscan fauna (gastropods and bivalves) and notes on environmental conditions of two adjoining protected bays in Puerto Princesa City, Palawan, Philippines. Journal of Entomology and Zoology Studies 2(5):72-90. Rahman S., Barkati S., 2012 Spatial and temporal variations in the species composition and abundance of benthic molluscs along 4 rocky shores of Karachi. Turk J Zool 36(3):291-306. Rios-Jara E., Navarro-Caravantes C. M., Galvan-Villa C. M., Lopez-Uriarte E., 2009 Bivalves and gastropods of the gulf of Tehuantepec, Mexico: a checklist of species with notes on their habitat and local distribution. Journal of Marine Biology 1-12. Schoppe S., Gatus J., Milan P. P., Seronay R. A., 1998 Gleaning activities on the islands of Apid, Digyo and Mahaba, Inopacan, Leyte, Philippines. Philipp Scient 35:130–140. Springsteen F. J., Leobrera F. M., 1986 Shells of the Philippines. Carfel Shell Museum, Philippines, 377p. Tabugo S. R. M., Pattuinan J. O., Sespene N. J. J., Jamasali A. J., 2013 Some Economically important bivalves and gastropods found in the island of Hadji Panglima Tahil, in the province of Sulu, Philippines. International Research Journal of Biological Sciences 2(7):30-36. Vaghela A., Bhadja P., Ramoliya J., Patel N., Kundu R., 2010 Seasonal variations in the water quality, diversity and population ecology of intertidal macrofauna at an industrially influenced coast. Water Science and Technology 61(6):1505-1514. Wernsted F. L., Spencer J. E., 1967 The Philippine Island World: A physical, cultural and regional geography. University of California, Barkeley Press, 742p.